In the last pre-election rally, Sinn Fein President Gerry Adams vowed his party would stand up for Irish citizens against bad government and bad government decisions. Calling on voters to return as many Sinn Fein TDs as possible in Friday’s 26-County general election, he said working people had “borne the brunt” of the failures of the government. He said the government cut social welfare by €873 million and then paid out €750 million to Anglo bondholders. He called for a renewed effort to prevent a complete sell-out by the 26-County state to foreign economic interests. “There is a better way. Through job creation, tax reform and eliminating waste Sinn Féin have shown how the deficit can be reduced over six years. He also vowed to “end the political gravy train” by cutting the salaries of ministers and TDs; abolish the Universal Social Charge and replace it with 48% tax rate on individuals earning over €100,000; and reverse cuts in social welfare. At an earlier event, he criticised the Labour Party for wanting to go into government with Fine Gael, saying it made no sense to him that a party which claimed to be left-wing wanted to attach itself to a conservative party such as Fine Gael. 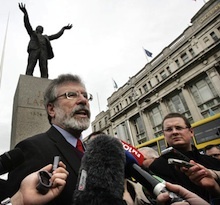 He urged Labour to work with Sinn Féin towards developing a right/left divide in Irish politics. Mr Adams also rejected criticism by Fianna Fáil leader Micheál Martin of Sinn Féin’s economic policies, saying the “real acts of lunacy were taken by Mr Martin and his party over the past 14 years, leading us to an unprecedented economic crisis”. “Whatever the outcome of this election, the Dáil needs a strong party of opposition. Sinn Féin is the only party that will stand up for ordinary citizens. All the other parties are for cuts. Sinn Féin is for jobs not cuts, for employment not emigration, for building the economy not cutting it. He said his party would work for a decent, universal public health system “available to all and based on need, not ability to pay”. “Sinn Féin is for Irish interests above those of the IMF; Sinn Féin stands for a united Ireland and a new republic.